The architects of the great medieval cathedrals and their builders are unknown to us. Their achievements remain, and have become a part of our cultural heritage – and these buildings still fulfill their original functions. Their airy soaring spaces continue to provide a haven of peace and contemplation, whatever the beliefs or non-beliefs of those who visit them. The builders of Russian Orthodox churches refined their interiors still further. During the building process rows of earthenware pots were cemented into the walls high up near the roof, with the exposed necks of the pots still visible. This feature, unique to these churches, is what provides the enhanced echo when an orthodox choir sings, giving the voices an ethereal resonance entirely appropriate to the music itself. We feel swept aloft by this music, with the entire building becoming itself a vast musical instrument of – literally – architectural proportions. Such cathedrals would once have dominated the skyline, even in the centre of a city. With some exceptions such as the cathedral of Chartres standing in the open French countryside, and with its magnificent labyrinth set into the floor, such city cathedrals, as we well know, are now overshadowed by the towering commercial buildings that now surround them: a telling-enough statement of the way in which economic concerns have come to dominate spiritual matters in our present day and age. And what of the churches of today? Why, with their determinedly modern designs, do they not seem to offer the same spiritual experience as the cathedrals of past centuries? The personality of the individual respective architects is what seems to impose itself upon us, rather than the anonymity of the medieval architects who placed themselves and their creativity in the service of a higher ideal. But there is more to it than this, of course – a lot more. A whole body of knowledge which involved knowledge of sacred proportions went into the building of such medieval masterpieces in stone. This knowledge was itself inherited from the ancients. The builders of Greek temples, and even the unknown builders of the Egyptian pyramids, used this same knowledge and these same proportions when building their own structures. These proportions have an astonishing universality, and also can be found in nature, from the human body to sea shells and the seed patterns in sunflower heads. The cathedrals, perhaps unconsciously, connect us to this sacred knowledge. When we are in such a space we feel the ‘rightness’ of its presence, even though we might not be openly aware that it is there, and present all around us. For these unknown architects, it provided an attempt to create the ‘holy city’ – the perfect architecture of the heavens – here on Earth. 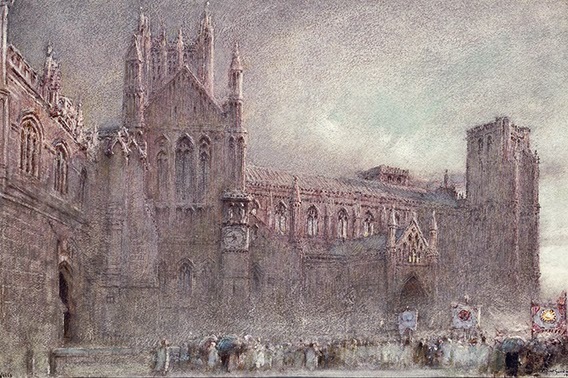 Even though this way of thinking has been lost to (or perhaps ignored by) today’s architects, we all of us still have the chance to attempt to build such a cathedral within ourselves, to create such an inner sacred space, and so allow ourselves to connect with the beautiful mysteries and call heaven down to Earth within us.